The 1803-1804 Tax records for Washington County, Maryland list the names, land holdings and possessions of those owing taxes. The records are ordered by Hundred, a term that referred to a civil divisions within counties, laid out by the justices of the county to make administration more efficient, as in the organization of road supervisors, constables, and tax collectors. Scharf noted that “in certain portions of England the subdivisions of a county or shire were called ‘hundreds,’ from the fact that they were supposed to contain one hundred families, one hundred freemen, or one hundred manors” (Scharf, 1882). 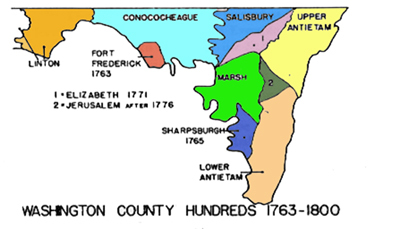 But by the 1800s in Maryland, it appears a hundred was merely an administrative division. For the rural dwellers the tax assessor lists the name, the land tract(s) owned, the number of acres and the value per acre, in pounds, shillings and pence. Land values from 79/- (shillings) for Smith’s Hill in Sharpsburg Hundred to 3/- per acre for Poppler (Poplar?) Spring in Linton Hundred. For town dwellers, the number of houses and lots are listed – in Elizabeth Town (later Hagerstown) Catharine Cooter owned 2 houses & ½ lots, Conrad Coffroth owned1 house & 3 ½ lots and Widow Elliott owed taxes on 1 house & 3 lots & a meadow. Other items considered taxable were stills, a legal business operation, and a way to transport grain in a liquid form. The type of carriages owned also determined taxes- gigs, hacks, coachees, phaetons and chairs (chaise?). These were not wagons for transporting goods, but carriages for conveying people. Furniture was taxed, as was plate – silver, measured by the ounce. Horses, cattle, hogs and sheep were all taxed. Several columns on the page refer to slaves. The amount of tax is based on gender and age. The most valuable slaves were males between the age of 14 and 45. Women 14 to 36 were taxed at two thirds the rate of men. Men over 45 and women over 36 were taxed at a much lower rate. Only a few slaves were untaxed. In one instance in the value column the word “blind” was written, in other “age” and no taxes were required. But even child slaves under the age of 8 had to be paid for. Alexander Clagett of Elizabeth Town (now Hagerstown) owned 8 slaves, Henry Schnebly of Elizabeth Hundred owned 50. There was an earlier Washington County Tax Assessment conducted in 1783. Some of this data is included in Volumes 7, 8, 9 of Western Maryland Genealogy, 1991-1993. Western Maryland Regional Library is grateful to the Riggs Conard Trust Fund which supported the transcription of these records by Elizabeth Howe, CA. The spelling of names and land tracts was not always clear, and while every effort was made to interpret the writing as it appears on the page, corrections are welcomed. Because of the size of the pages, each page has been divided into three parts. The first includes the land holdings and plate, the second the slave information, and the third animals, still, carriages and furniture. On the first page of the group of three is a PDF of the entire page. Click on the PDF icon to see it.